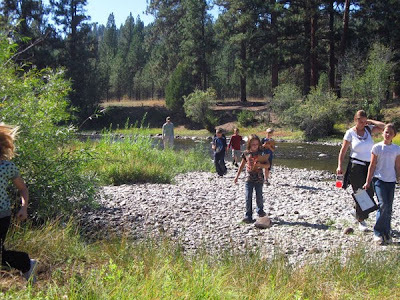 The Blackfoot Challenge sponsored its 9th Annual Youth Field Day on September 23, 2009. At the Harper’s Lake Fishing Access on the Clearwater River, just upstream from its confluence with the Blackfoot River, over 100 fourth through sixth grade students from all over the Blackfoot Watershed came together for a day of outdoor education. Photo Above: In the Water Droplet Journey game, students flip a “dice” high into the air. The result will tell them where to go next in the water cycle. Youth Field Days engage local students in their watershed, while addressing topics from natural resource issues to community sustainability. The topic for this year was Transportation, and students tackled the issue through stations on Seed Dispersal, Navigation, Mule Packing, Water Droplet Journey, and Journaling. 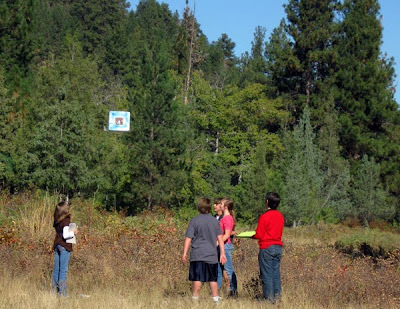 Photo Above: Students practice their observational skills before journaling on the banks of the Clearwater River. CFWEP Curriculum Coordinator Rayelynn Connole led the Journaling station, where students learned to describe nature in their watershed, just as Lewis and Clark’s Corps of Discovery observed and documented the American northwest. CFWEP AmeriCorps VISTA Lorna McIntyre and Janel Evans, Montana Tech AmeriCorps Team Leader, immersed students in the water cycle through the Water Droplet Journey game. Playing the role of a drop of water, students learn the varying pathways a water molecule can take through the water cycle. By learning only a small amount of water is available for human use, student gain a greater appreciation for their watershed and the value of clean, healthy water. And in the Blackfoot Valley, clean water and watershed stewardship will maintain the natural beauty of the Blackfoot River ecosystem well into the future. For more information on our partners at the Blackfoot Challenge, visit http://www.blackfootchallenge.org/.